Microevolution refers to the evolution of populations within the same species. 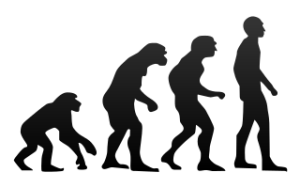 Although it may seem rather narrow, the term ‘microevolution’ actually encompasses a variety of topics. Microevolution is of particular interest to humans, because it can provide insight into any differences between human populations, whether these differences are in disease susceptibility, height, fertility, or some other factor. Scientists have been studying the differences between populations of people in order to gain insight into the causes of diseases. The study of microevolution also helps us to understand how pathogens acquire antibiotic resistance. The types of microevolution described thus far refer to the evolution of populations consisting of individual organisms within the same species. Within multicellular organisms, microevolution also occurs in populations of our cells. Physicians and scientists study this type of microevolution to understand one of the most prevalent human diseases: cancer. The development and progression of cancer requires many mutations in most cases and examining cells in a tumor can provide insight into which mutation(s) happened first and which mutations happened later. This type of research can pinpoint mutations that lead to cancer metastasis (the ability to spread to other tissues) by comparing mutations in cells that traveled to other tissues with cells are stuck in the tumor. Macroevolution, on the other hand, refers to the evolution of higher taxa, i.e. evolution occurring at a level higher than within a single species. When thinking of macroevolution, an image of a phylogenetic tree or the tree of life comes to mind. The topic of macroevolution encompasses the origin of a species, species divergence, and similarities/differences between species. The study of macroevolution can be used to determine what makes certain plant species toxic while others are edible or why some animals are immune to disease while others are susceptible. From examination of extinct Homo species to better understand our ancestors to comparing how different types of pathogens avoid the immune system, the topic of macroevolution covers a lot of ground. Despite these differences, both microevolution and macroevolution involve the same principles and occur by the same mechanism. Both microevolution and macroevolution occur as a consequence of mutation. Genomic DNA is constantly subject to a low rate of mutation. This is true whether a cell’s DNA is being stored in the nucleus or if it is actively being replicated. Mutations are alterations in the nucleotide sequence that are caused by random damage or mistakes during replication or repair. Additionally, both macro- and microevolution involve migration, or the movement of individuals between populations, as well as genetic drift, or random changes in the frequency of certain traits or mutations within a population. Lastly, both microevolution and macroevolution are products of natural selection. Natural selection is the spreading or disappearance of a trait in a population over time (through increased or decreased survival or reproduction) that leads to a change in the frequency of genotypes in the population. To better understand natural selection, let us consider it in the context of gene mutation. The mutation of genomic DNA can produce one of three outcomes. First, the mutation could be neutral, meaning that no real change to the cell or organism occurs as a result of the mutation. This type of mutation may be maintained or may be lost with time (due to genetic drift). The second type of mutation could produce a favorable outcome, producing a more efficient protein or imparting some other advantage to the cell or organism. The third type of mutation is a deleterious or unfavorable mutation. This type of mutation is usually lost, as cells or organisms that carry this mutation may have decreased rates of survival or reproduction. Different areas of the genome are subject to different rates of mutation. For instance areas that contain no genes or no sequences that affect genes have mutation rates that equal the frequency of random errors. On the other hand, a critical gene will have a very low mutation rate, because almost any mutation in a critical gene will be deleterious. These genes are termed ‘highly conserved’. The sequences of highly conserved genes, such a ribosomal proteins, can be used to make comparisons and hypotheses about macroevolution of distantly related organisms (such as bacteria and animals). Other genes have evolved more recently, and may be unique to a specific group of organisms. Analyzing sequence similarities in these genes can provide information about closely related species (macroevolution) and can even be used to compare differences between populations or individuals of the same species (microevolution). For instance, the influenza virus evolves quickly to avoid immune system recognition. In the case of influenza, any changes (mutations) in the hemagglutinin protein on the viral surface that help the virus evade the immune system would be advantageous. Examination of influenza microevolution caused by genomic mutations in coat proteins informs the production of new influenza vaccines every year. In summary, macroevolution and microevolution represent the same process, driven by random mutation and natural selection, at different scales. Although it may be difficult to link the changes that occur during microevolution (such as development of drug resistance) to macroevolutionary changes (such as the evolution of new species), consider the amount of time that is required for each. Microevolution can be observed within a lifetime and can be directly measured. Microevolution occurs with every new generation and even within a multicellular organism (as in cancer). Macroevolution takes a much longer time and must be viewed from a different perspective. Life on earth has been undergoing microevolution for 3.8 billion years, and that is a lot of time for micro events to produce macro results. Crystal Wall. "Difference Between Microevolution and Macroevolution." DifferenceBetween.net. June 8, 2016 < http://www.differencebetween.net/science/difference-between-microevolution-and-macroevolution/ >. Molecular Biology of the Cell, Fourth Edition. Bruce Alberts, Alexander Johnson, Julian Lewis, Martin Raff, Keith Roberts, and Peter Walter. Reznick DN & Ricklefs RE. 2009. Darwin's bridge between microevolution and macroevolution. Nature 12;457(7231):837-42. doi: 10.1038/nature07894.